An auto maker revs up its payout, as does a veteran technical glass specialist and a noted aerospace and defense company. This cold February is shaping up to be a hot month for dividend raises. For the second consecutive week, we saw a big group of companies hike their payouts, in some cases quite substantially. Among the many raisers were Harley-Davidson (NYSE:HOG), Corning (NYSE:GLW), and L3 Technologies (NYSE:LLL). Here are a few words about these freshly enhanced dividends. Harley-Davidson is raising its quarterly dividend 1% to $0.37 per share. The storied motorcycle maker also launched a new stock repurchase program for up to 15 million of its shares. 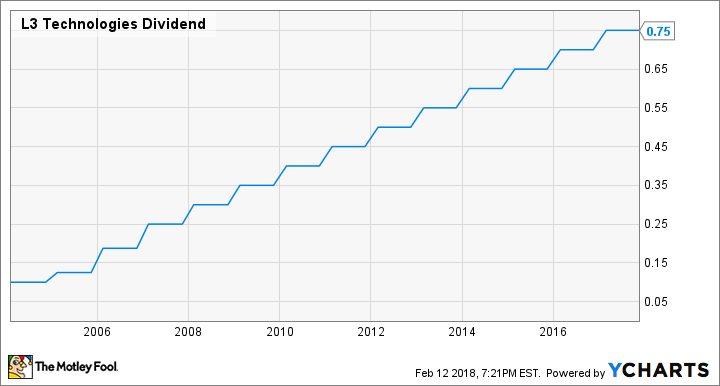 Perhaps the cautious increase in the dividend is warranted. The company's Q4 and fiscal 2017 results featured a bunch of negative growth figures. For the year, shipments declined by 8% on a year-over-year basis, as did sales figures in each of its five regions around the world. It seems that customers favor lighter and cheaper vehicles over the large, expensive bikes that are Harley-Davidson's specialty. The company is closing factories and laying off workers in order to improve its situation. It's also planning to roll out an electric bike in line with recent vehicle trends. None of these moves will likely affect the dynamic in shipments, which it projects will drop by 4% this fiscal year. 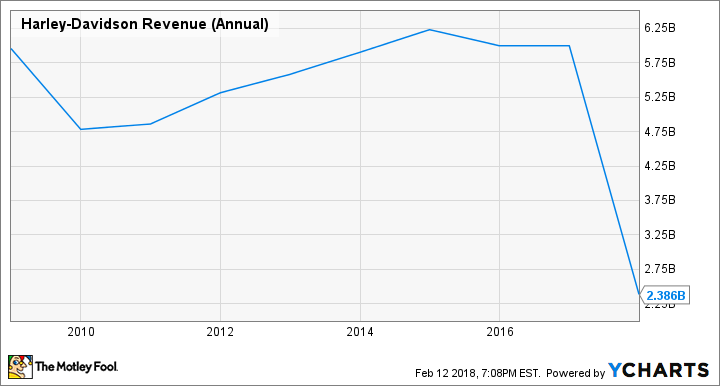 Although the company has plenty of free cash flow to take care of the dividend plus a few rounds of those share buybacks, its business overall doesn't seem to be heading down a good road. I'd advise caution for income investors considering a ride on this stock. 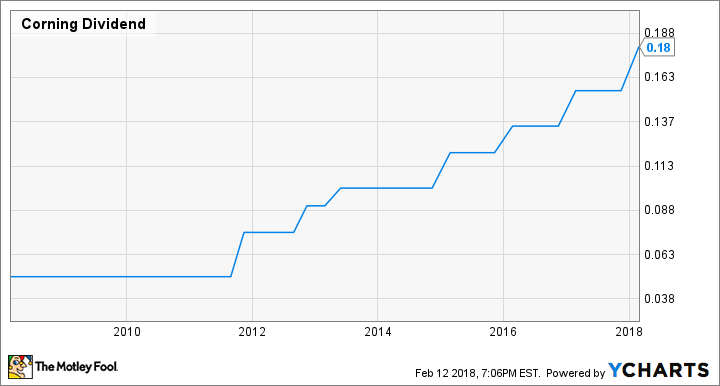 Harley-Davidson's new dividend will be handed out on March 2 to stockholders of record as of Feb. 14. Its payout ratio is 640%, although the company's Q4 net profit was negatively affected by one-time charges related to the new corporate income tax regime. Meanwhile its yield would be 3.1% -- some distance above the current 1.8% average of dividend-paying stocks on the S&P 500. Our hands-down winner for largest percentage raise among this trio is Corning, with a 16% increase in its quarterly payout to $0.18 per share. The technical glass maker lands consistently in the black, and is still growing; fiscal 2017 "core" (i.e. adjusted) net sales rose a sturdy 8% to $10.51 billion. Although core earnings were down on the year, they weren't down by much, dipping by 1% to land at just under $1.76 billion. Corning's top-line growth came from sales improvements in four of the company's five divisions. Honorable mention goes to specialty materials (headline net sales up 25% to $1.40 billion), and the crucial optical communications unit (18% higher at almost $3.55 billion). These dynamics should help the company maintain growth, although not at spectacular rates. On average, analysts are expecting its top line will expand by 3% this fiscal year, with core earnings to rise by 2%. As with many companies, Corning's 2017 net profit was negatively affected by the changes in the tax law. This affected operating and thus free cash flow, both of which were down notably on the year. Even without that one-time quirk, Corning tends to spend lavishly on share buybacks and has pledged to keep aggressively lifting its payout, tendencies investors should be wary of. Corning will pay its next dividend on March 29 to shareholders of record as of Feb. 28. It yields a theoretical 2.4% on the most recent closing stock price. Its payout ratio is 37% on the most recent quarterly core EPS figure. A relatively new player in the aerospace and defense field, L3 Technologies is also a relatively recent dividend payer -- it initiated its quarterly distribution in 2004. Since then it's raised the payout once every year; the 2018 addition is a 7% bump to $0.80 per share. As with Corning, all but one of the company's divisions (it has four in total) delivered higher net sales in fiscal 2017, with overall top line rising by 4% for the year. Net profit from continuing operations saw much more improvement, increasing by 22% to $753 million ($9.46 per share), although within that the Q4 figure was helped by a $79 million benefit from the aforementioned tax law changes. President Trump aims to boost military spending significantly, and even if his grand ambitions aren't fully realized, this year should generally be a good one for defense and aerospace companies. L3 Technologies has upped its profitability guidance for fiscal 2018; it now expects per-share net profit will land between $9.30 and $9.50 (it previously projected $8.60 to $8.85). Although the company's operating and free cash flow figures were both down a bit in fiscal 2017, it has more than enough to cover its fairly modest level of share repurchases and a not-very-generous dividend. So I think those annual distribution raises will continue well into the foreseeable future. The upcoming L3 Technologies dividend is to be handed out on March 15 to investors of record as of March 1. It would yield 1.6%, and its payout ratio is a light 35%. Since we're drifting out of earnings season, I would expect the number of dividend raises to taper off in the next few weeks. Still, 2018 has been a good year for hikes so far (knock wood), and companies that pay decent dividends are more attractive in times of market turmoil. Perhaps, like its predecessor, 2018 will end up being a strong year for distribution increases.